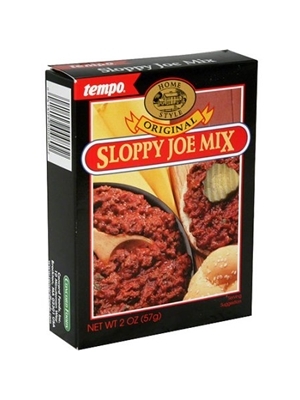 Sloppy Joes: Homemade Sloppy Joes made easy! A fun family favorite - these delicious sandwiches will make your family ask for seconds. 1. Brown beef in a large skillet. Drain off fat. 2. Add contents of package, tomato paste and water. Bring to a boil. Reduce heat and simmer 10 minutes, stirring occasionally. Serve over toasted hamburger buns or wedges of toasted cornbread. For extra flavor and color, saute 1/3 cup of chopped green pepper and/or 1/3 cup chopped onions with beef in step 1. ​Yellow corn flour, sugar, dextrose, onion, salt, spices, garlic green bell pepper, celery seed, natural flavor. May contain trace amounts of soybeans.